Easter activities for kids can be easy and inexpensive to create and implement. While most people associate coloring and hunting Easter eggs as the primary activities linked to this holiday, there are lots of other fun things that you and your kids can do to commemorate this occasion. Keep reading for some great ideas. Marbled Eggs: Drop shaved pieces of crayons into a cup of very hot water, and add an egg. Gently swirl the egg and the crayon shavings around in the water until the egg has reached the desired color and effect, then remove and set up to dry. Sponged Eggs: It's best to use either the traditional colored water or tempera paints for this method. Cut up or pull apart sponges. Then, dab the sponges into the paint and onto the eggs. Set the eggs up to dry. For a little less mess, attach clothespins to the sponges to use as applicators, keeping little and big fingers dry during the sponging process. Striped Eggs: You can add stripes to your eggs by applying masking or electrical tape around the eggs. Dip the eggs in your color mixture, and, once dry, remove the tape. For contrasting colors, cover the stripes with tape after the egg has dried, and dip again in a different color, then remove the tape. Mottled Eggs: Instead of simply dipping the eggs in the color mixture, apply the color with crumpled pieces of paper. You'll create a nice, mottled look for your eggs. Try using two or three colors on one egg. Easter Bunny Crafts: Choose from three easy crafts. Your child will enjoy creating a cute bunny from construction paper, glue and a traced outline of his hand. You can also make a bunny clip made from a clothespin. These cute clips can be used as chip bag clips, refrigerator magnets or bookmarks. You'll also find instructions for making bunny finger puppets, sock bunnies and bunny ears. Easter Cereal Flowers: Create a beautiful flower or an entire bouquet of flowers from paper plates and colorful cereal. Popsicle sticks serve as the stems. This article also features other Easter crafts children will enjoy, such as a "stained glass" butterfly and a paper mache Easter basket. Homemade Clay Easter Craft: Make clay from flour, salt and food coloring. Use cookie cutters or sculpt the clay into Easter shapes. You can even create a lesson for Sunday school in conjunction with the craft activity. Draw an Easter Bunny: Have your kids follow step-by-step directions on how to draw an Easter bunny. Follow the slides to create a cute bunny that can be added to an Easter card or picture. Pinata Party: You can purchase inexpensive piñatas shaped like ducks, eggs, or bunnies, fill them with candy, and let the kids take turns trying to break them with a stick. Adult supervision is certainly needed for this activity. Sensory Easter Eggs: Use an empty cardboard egg carton, plastic egg shells and Easter-themed items that speak to all fix senses. Let your child choose which items to fill the eggs with, but he must state what the sense is. For example, jelly beans would be taste while a fuzzy yellow toy chic would be touch or possibly sight. Carrot Hunt: Oh no! The Easter Bunny has lost his carrots. Have your children run around and try to collect them all on Easter-eve and leave them for the Easter Bunny to munch on when he arrives Easter morning. Once the kids go to bed, take a few bites off some of the carrots to prove the bunny himself was there to visit and appreciated all their hard work. Bunny Face: Give your child a hand mirror, some face paint and a pair of inexpensive bunny ears and tell her to paint on a bunny face. It is also a good idea to have some cartoon pictures of bunnies for her to compare to her own artwork. Take a photo or two when she is done. You'll want to preserve the moment. 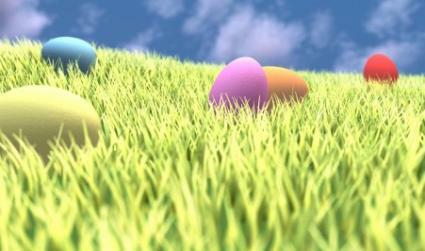 Claymation Easter: Do your children enjoy claymation cartoons? Have more than one child or planning to have a few over for the day? Give the children modeling clay and ask them to come up with a story idea about Easter. The children should make figures for the characters in the story. Next, have the children paint the inside of a shoebox to create a background for the clay figures. While a traditional claymation cartoon would take hours upon hours to create, speed things up by having your children act out the parts and filming it all at once, with their hands in the scene. Don't worry. It will still be fun for the whole family to watch together later that evening. Older children may have the patience to position figures and do some editing to make the movie more professional looking. Whether you simply dye eggs each year, have a massive themed egg hunt, or you use another activity, try to create Easter traditions. Years from now, you will enjoy watching your grown children pass these activities down to the next generation. Watching your family laugh and enjoy one another's company is worth the small amount of time it takes to prepare these simple Easter activities.